Ford has always had the most loyal fan base, and one of the main reasons is that they genuinely care for anyone who dreams of reliable mobility. Whether you are male, female, old, young, or anything else this world has to offer, you should have the right to have a vehicle that was made with you in mind. No matter what your needs are, Ford has worked tirelessly over its many years in the automotive community in order to not only listen to what drivers want and need in a vehicle but to make those wishes a reality. That reality is as close as a trip to your local Ford Dealership. Speeding and towing are two things Ford has perfected during its countless years of innovation and customer service. Just looking at the Ford F series trucks alone will show you what muscle was always meant to look like with its towing capacity of 20,000 pounds, and the new Ford Mustang Shelby is a performance legend on and off the track with a max of over 500 horsepower with a supposed increase to 700 horsepower in the near future. When you walk into your local Ford Dealership, like Vogler Ford, you never have to worry about finding a vehicle that’s tough enough. There is nothing more natural than wanting to take control of your life. Ford dealerships offer all the high-grade steering and braking options in order to present you with a smooth and enjoyable ride that goes where you want it exactly when you want it to. Offering state of the art technology, design, and components in all of our models to make sure our vehicles are as fun to drive as they are to look at. Two words “Ford Expedition.” This brilliant beast of an SUV can hold up to 8 people comfortably and still offer 20.9 cubic feet of cargo space, but if you want to kick those people to the curb, you can get a massive 104.6 cubic feet which will fit roughly 20 large-size boxes. There are also plenty of other Ford vehicles that offer plenty in the areas of seating, cargo space, and premium utility that can be used with ease. Ford may not be labeled a luxury car manufacturer, but look at any Ford Dealership, and you will find that the features they offer can seem every bit as luxurious as any other “luxury” automaker has to offer. One feature, in particular, is that is the ventilated and heated leather seating available in every Ford SUV at any Ford Dealership. Another luxury item you won’t want to miss is dual-zone climate control for when those in the front who forgot their jacket, and those in the back who are running hot. Both the driver and all of their passengers are sure to be comfortable in any Ford vehicle. There is also Sync3 technology that is standard with the majority of modern Ford models. This is an infotainment system that will keep you connected with your smartphone at all times, making driving and talking, which of course none of us would ever do, a much safer feat. Sync3 works with any Apple or Android smartphone through Bluetooth technology and allows you to use all your favorite apps such as music and maps; getting lost or being forced to listen to endless radio commercials is no longer a possibility. Speaking of safety, automobiles that prioritize safety these days are some of the first to go. Ford, in order to accommodate this demand, does offer a Ford Safe and Smart Package with a number of brilliant safety features that will increase your alertness and make all worries vanish like a puddle on a summer day. 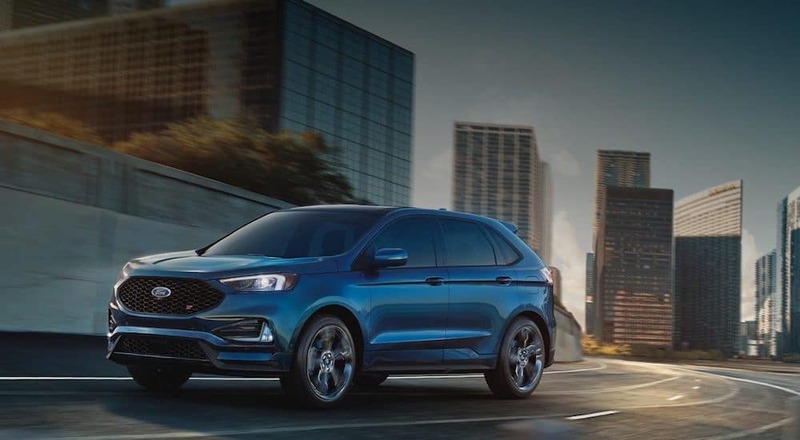 Additionally, a number of Ford vehicles has received a 5-star crash rating from the NHTSA due to not only the package but the well-designed airbag system, tire pressure monitoring, and stability technology. Confidence is something every driver should have because a healthily confident driver is not only a happier driver but a safer driver as well. Sure being a road warrior isn’t exactly safe, but being a hesitant driver will also cause a fair share of accidents. Ford has carefully engineered vehicles with technology and safety features that allow confident, happy drivers. So, be sure to invest in a vehicle that makes you shine with confidence. There are millions of ways a Ford vehicle can make your life more convenient, but let’s start with the most painstaking task that was ever conceived by human society, parking. Ford offers enhanced parking assist technology that will help you pull in, pull out, and even nail that tight parallel parking in the city by scanning the area and warning you when you get too close. The parallel parking feature will even practically do the parking for you. You really can’t get more convenient than that. Choose a Ford Dealership Today! Our world is evolving, and so is Ford. Everyone desires the freedom of mobility in order to see this beautiful, surprising, thrilling world we live in, and everyone deserves the right to experience that mobility in a way that fits them. Ford is not just a one trick dealership, but a manufacturer that strives to listen to the world around them and innovate automobiles of all shapes and sizes for all types of people. When it comes to dealerships, you can feel confident that a Ford dealership will provide innovative and consumer-driven manufacturing, offer vehicles that are bold and confident, but also convenient and safe, and have something for everyone. If you’re interested in purchasing a vehicle from a Ford Dealership and investing in this reputable brand, visit Vogler Ford today!